If you find yourself breaking out from dairy milk, you’re not alone. 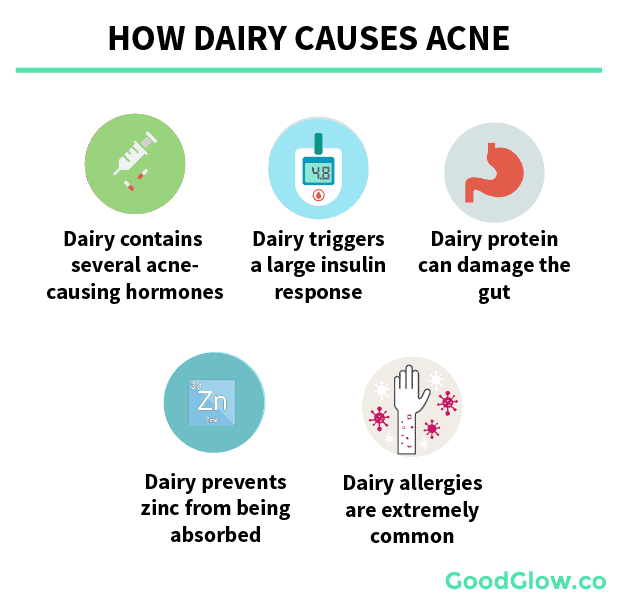 Dairy, and more specifically, dairy milk, is one of the worst food groups when it comes to acne. But what about milk alternatives, like almond, soy, coconut, hemp, oat, and flaxseed milk? Believe it or not, these milk alternatives could be doing more harm than good for your skin. 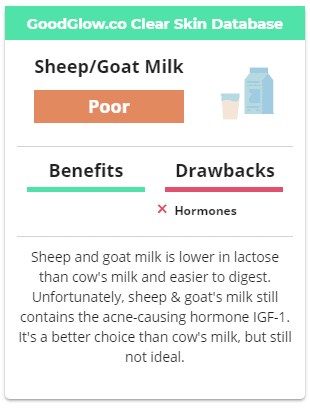 While some dairy is better than others on these issues, milk is one of the worst. Overall, milk is one of the worst drinks you could have if you’re trying to get clear skin. While raw, grass-fed milk from sheep or goats is likely to be tolerated better than pasteurized cow milk, it’s still not a good choice. Luckily, there are some much better options when it comes to dairy-free milk substitutes for acne-prone skin. Before we begin, let me just say this: quality counts when it comes to dairy-free milk substitutes. If you’re buying coconut or almond milk with tons of added ingredients and sugar, it’s not going to matter how organic or high in vitamin E it is. It’s still likely going to trigger a large hormonal release that’ll make your acne worse. Always go for sugar-free, natural milk alternatives with the least amount of added ingredients as possible. Coconut milk is low in sugar, low in inflammation-causing omega-6 fatty acids, and high in skin-clearing nutrients, including magnesium (26% DV/cup), potassium (142%), and selenium. It’s also a great source of high-quality saturated fats, which are a much better fuel source than carbs and sugar when it comes to acne-prone skin. The fat in coconut milk is also a great way to eliminate harmful bacteria and lower inflammation, two additional benefits for acne. On top of that, most coconut oil is gluten-free, soy-free, and unlikely to cause any issues to your gut or digestive system. Coconuts are among the safest, most digestible plants you could possibly eat. You can make your own coconut milk or purchase high-quality, unsweetened coconut milk online (I prefer the powder) or at most grocery stores. Bottom line: Coconut milk is not only a safe choice for acne-prone skin but also a food that could help clear existing acne. Almond milk is another solid choice for acne-prone skin, but not quite as safe or beneficial as coconut milk. 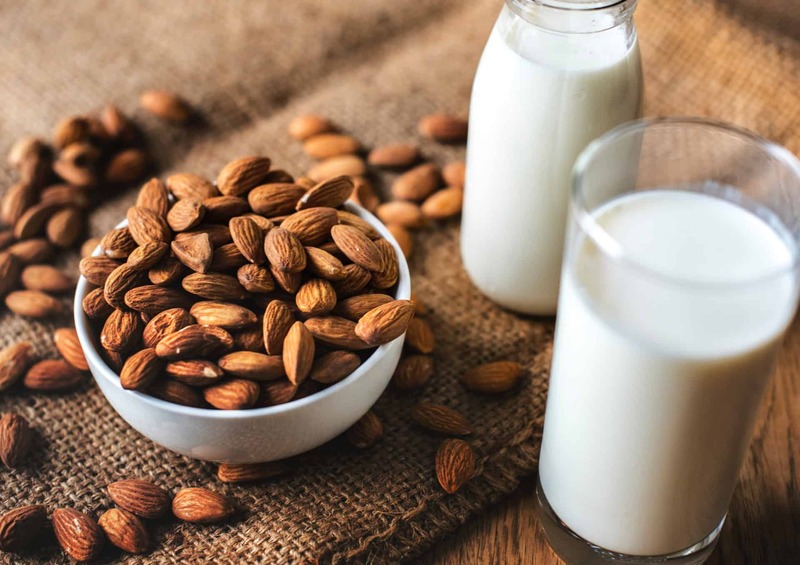 On the downside, almond milk is a little higher in omega-6 fatty acids (which can trigger inflammatory acne) and is more commonly attributed with digestive issues. Sensitivities and intolerances to almonds are fairly common. 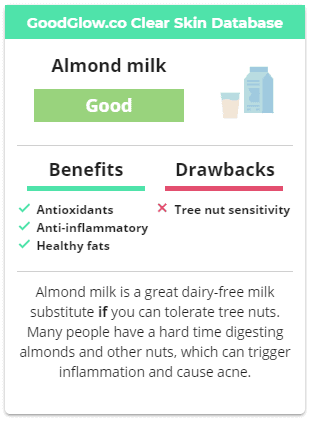 If you have a hard time handling certain tree nuts, almond milk can make acne worse. Sometimes almond milk is fortified with really high amounts of vitamin B12, which has been linked to increased acne1https://www.sciencealert.com/common-vitamin-linked-to-higher-risk-of-acne (and is probably the reason your multivitamin is giving you acne). Making your own almond milk at home using sprouted or raw almonds are probably best. Still, the majority of unsweetened almond milk will be fine for acne-prone skin. Rude Health Almond Milk is my preferred brand. It contains only two ingredients: organic almonds and water. 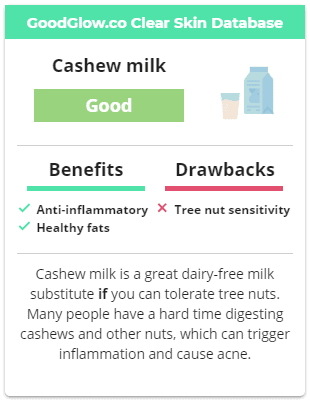 Even though cashews aren’t exactly one of the safest nuts for acne, cashew milk is a pretty great choice for acne-prone skin. Some people also have a hard time digesting cashews and other nuts – if this is the case, don’t try cashews. Not all of these cow milk alternatives are absolutely horrible for acne. Some of them are still much better than cow’s milk for acne-prone skin. If you can, stick with the alternatives above if you’re trying to eat a diet that leads to clear skin. A better choice than milk from cows? A good choice for your skin overall? Probably not. Overall, you’re much better off going with a plant-based, dairy-free milk alternative like coconut milk or almond milk. Oat milk actually isn’t the worst choice when it comes to dairy-free milk alternatives. In fact, some people might tolerate it just fine. Most oat milk contains trace amounts of gluten from processing. If you’re sensitive to gluten, this can be an issue. These aren’t enough to make oat milk public enemy number one, in fact, it’s probably a better choice for most people than cows milk. 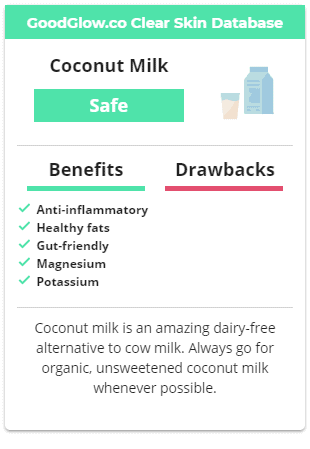 Still, when there are alternatives like coconut milk or almond milk available, it’s a no-brainer to go with these safer options. 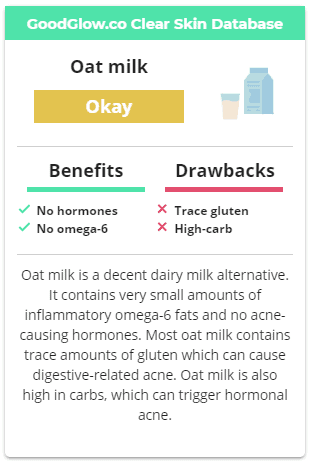 Bottom line: Oat milk isn’t a horrible choice for ance-prone individuals, unless you are sensative to gluten or carbs. On the surface, hemp milk looks like a decent alternative to dairy milk for acne-prone skin. It’s low in carbs and high in nutrients like magnesium. Unfortunately, hemp milk is extremely high in inflammation-causing omega-6 fatty acids. A single cup of hemp milk has over 3.0g of omega-6 fatty acids. Consuming too many omega-6s without enough omega-3s (found in fish) can lead to chronic inflammation – a condition where the immune system fires off an inflammatory response for minor threats, including acne. This takes a relatively harmless acne infection and turns it into a bright, red, protruding pimple. Even though hemp milk is high in omega-3 fatty acids, which help fight inflammation, they’re high in the wrong type of omega-3s, ALA. Your body is very inefficient at breaking down ALA omega-3s into usable omega-3s, which is part of the reason why plant-based and Vegan diets can lead to acne. 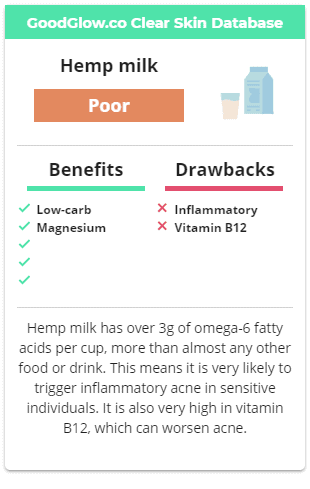 On top of that, hemp milk is high in vitamin B12, which can make acne worse2https://www.sciencealert.com/common-vitamin-linked-to-higher-risk-of-acne. 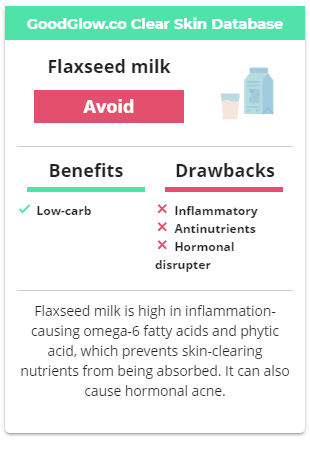 On the surface, flaxseed milk looks like a good alternative to dairy milk because it’s low in carbs and high in anti-inflammatory omega-3 fatty acids. Finally, the form of healthy, anti-inflammatory omega-3 fatty acids found in flax milk, ALA, is not the body’s preferred form. ALA is extremely inefficient to break down into usable DHA and EPA omega-3s (which is why you might want to take a high-quality fish oil supplement). Soy and soy products, including soy sauce, tofu, soy milk, and even plant-based protein powder, is a nightmare for acne. Soy milk is high in saponin and phytic acid, which are compounds (antinutrients) that can easily cause damage to the digestive system. These compounds prevent crucial skin-clearing nutrients, like zinc, from being absorbed. Furthermore, soy milk is high in phytoestrogens, which can disrupt your hormonal balance and lead to hormonal acne. 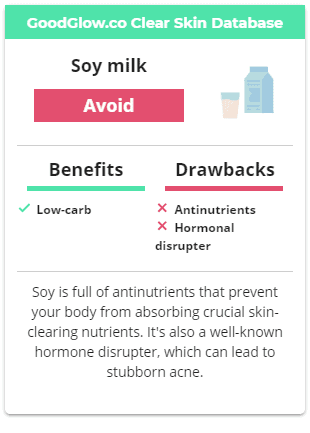 Just like dairy milk, soy milk can lead to hormonal acne. Even though it’s low in carbs and omega-6 fatty acids, soy milk is one of the worst choices when it comes to plant-based milk substitutes. Remember, the most important thing when it comes to buying milk alternatives is avoiding added ingredients and sweeteners that cause acne. 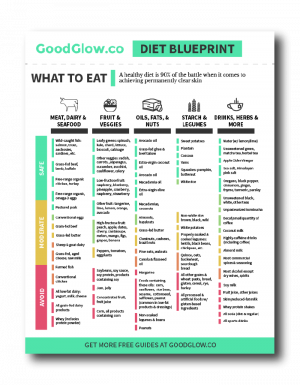 You can find a full list of ingredients to avoid in the GoodGlow Shopping Guide.